Our chemical free Pure Goat Milk Solid Brush Shampoo® is a best seller and gets rave reviews every time... Combining Essential Oils, Goat Milk, Pure Organic Cleansers and Tea Tree, not only will your brushes smell fabulous, but they will be sanitized and conditioned to a silky soft finish without leaving residue on the hair. And a solid shampoo means no spills, no waste and most importantly no harm to the environment. Made by hand in California, USA with integrity and care. This soap is a little piece of heaven! I'm already a huge fan of washing my brushes! I know many of you this is your least favorite thing to do when it comes to Makeup! This process is a very important one... especially if your a MUA! Keeping your brushes and Makeup tools clean and sanitized should be at the very top of your list! I use to use your standard brush shampoo to clean my brushes until I try this! All you need to do is wet your brush and swirl it around right in the jar to pick up some soap. Then in circular motion in the palm of your hand work the soap in the bristles. Rinse and repeat if necessary! First time I used this I could feel my brushes get softer...seriously! They feel so luxurious. The smell is amazing! It smells pure and natural, not like other brush cleansers. It's made with all natural ingredients. There are a couple of different scents to choose from Lemon, Lavender and Natural. The smell isn't over powering. Even your toughest brushes to cleanse... like your gel liner brushes... clean effortlessly! No more pulling out the coconut oil to deep clean it because it's already a ingredient in the soap! Don't miss treat your beautiful brushes that you spent your hard earned $$$ on! Treat them, Clean them and keep them in the best shape possible! Would I buy it again: Yes! Keeping your Makeup tools and brushes clean and sanitized is VERY important! This soap makes it easy! You can purchase this product from Fusion of Color and save 10% off the market value! Click Here! i need to get this!!! sounds like an interesting product. i'm curious to try but concerned about the bacteria. what is the sanitizing ingredient in this product to kill the bacteria on the brushes? let me know! thanks, nikki! It contains Tea Tree Oil! where is it listed? i don't see it in the ingredients list. it just says "essential oils" on both the packaging and the website. :( i'm not a fan of products that aren't transparent with all of their ingredients. thanks, nicki! Hello Betty.. 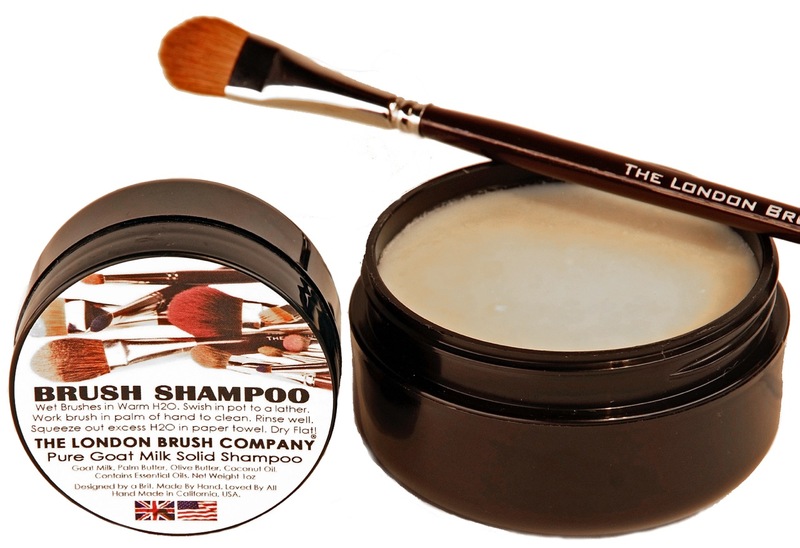 The London Brush Company Pure Goat Milk Solid Brush Shampoo is a blend of Saponified Goat Milk, Vegetable Oils, Extract of Tea Tree and Lei. the e3ssential Oils are either French Lavender, Pure English Lemon, or No Essential Oil in the Natural. I designed it this way to offer an essential oil free version for those with allergies. There is no product like it on the market, it's 100% Organic and made in California. I will advise you that no matter how many ingredients are listed on products, some will always be omitted in order to protect exclusivity. My Brush Shampoo non toxic and if a child were to ingest some, they would be absolutely fine. ps.. The Ingredients are listed on the lid.